While shunned by many health food gurus for its high saturated fat content, there are still many nutritional benefits to be gained from this exotic produce. Although research on many medicinal and health uses of coconut oil are preliminary at best, early studies and trials show that this tropical meaty palm byproduct may have more uses than previously imagined. We’ve compiled a list of ten for you to explore to find out how coconut can enhance not only your cuisine, but also your health as well! 1. Head Lice Treatment: Got head lice? Well then consider this little known secret amongst coconut oil health benefits. Early research indicates that combining coconut oil with ylang ylang oil and anise oil can be nearly as effective as harsh chemicals at eradicating a case of unwanted scalp residents. It’s also likely to be safer and less irritating as well! 2. Weight Loss: While coconut oil nutrition facts are scary considering the high amount of saturated fat that will appear on the label, surprisingly, small trials have shown that small amounts of coconut oil can help stave off obesity due to their ability to help the liver break down healthy fats; but, don’t be surprised if you have people scratching their heads when you mention your new coconut oil weight loss plan. Just remember that moderation is key! 3. 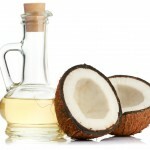 Cholesterol: Raising good cholesterol has been documented in people reaping the benefits of coconut oil. However, bad cholesterol also seems to climb as well. While more research is needed to clearly identify the heart healthy gains attainable with coconut oil health benefits, studies show it has abilities to be a bad cholesterol reducer. 4. Skin Treatments: The moisturizing and healing properties of coconut oil make it an effective remedy for dry and itchy skin and as such, you’ll find it used in a wide variety of skin care products that are designed with softening, smoothing and even anti aging in mind that have long taken advantage of coconut oil skin benefits. 5. Hair Treatments: Boasting both moisturizing properties and a healthy dose of vitamin E, coconut oil health benefits include helping you achieve luxurious, soft and silky locks. 6. Immunity Boost: Containing lauric acid, a known anti microbial, anti fungal and anti bacterial, it’s thought that greater immunity to viruses and other health hazards can be obtained by using coconut oil. 7. Metabolism Boost: By not only balancing thyroid hormones but also by increasing both energy and endurance, it’s thought that coconut oil health benefits can include a metabolism boost. This increase in energy and vitality can in turn contribute to greater weight loss by providing the energy you need to burn the calories away! 8. Digestive Aid: By helping the digestive system process tough to break down edibles, coconut oil is thought to be useful in aiding digestion. 9. Antioxidant Helper: The special oils found within the coconut can be useful in boosting the antioxidant activity of the body. This can help to prevent damage to cells, skin and organs that can help reverse the signs of aging and also boost cardiovascular health. 10. Improved insulin use: Helping the body handle its insulin is one of the purported coconut oil health benefits touted by proponents. By improving the use of insulin throughout the body, it’s thought that blood sugar can be better controlled.